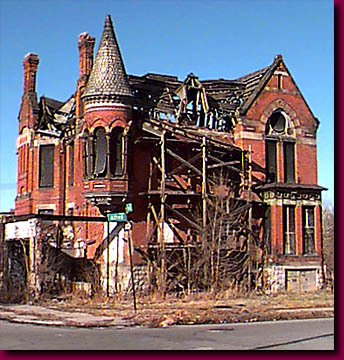 The Ransom Gillis House at the corner of Alfred and John R. bespeaks the glories of the Gilded Age in Detroit. 19th Century Detroit became a thriving city by brokering its lumber age wealth into an industrial base that provided the basis for the automobile explosion which soon followed. Detroit's upperclass built sumptuous residences on the outskirts of the city which today lay deep within the urban sprawl. These ruins may be seen today in the Brush Park area and along Trumbull Avenue north of Grand River Avenue.